Our 2008 Road Trip, Part 3: The Original Thomas and Martha « Midlife Crisis Crossover! He gets his name on the obelisk. Hers is down on the base. To be fair, he lived at Monticello longer than she did. DAY TWO: Sunday, July 13, 2008. The hotel provided a free hot breakfast of eggs and sausage. The hungover Legionnaires that took up all the tables provided less of a floor show than I would’ve hoped. The lobby parrot provided no movement at all and was probably counting down the minutes till everyone’s checkout. Several of us non-Legionnaires had the same bright idea of checking out at the same time and as soon as possible. If only we’d known, we could’ve better coordinated our schedules. We crammed into the elevators as cooperatively as we could, but I had to balance our cooler on my head to allow enough breathing room for others around me. Mind you, this was a cooler spacious enough to hold an entire 24-pack of bottled waters, plus a few cans of diet soft drinks, plus some Gatorade, plus adequate ice coverage. I’m not a circus strongman. It took more muscle than I actually have to manage that feat and not crush anyone. It’s even less delightful for someone who’s had randomly recurring back spasm issues on and off since 2004. For our last run from the room to the car, Anne and I bypassed the elevators altogether and took four flights of stairs both ways without complaining. Out loud, anyway. The morning drive through the West Virginia mountains took us into Virginia, where we angled to the northeast toward our main attraction for the day in Charlottesville. Before vacation we’d mulled over the idea of doing lunch at the historic Michie Tavern circa 1784, where you can dine Revolution-style. Then we thought better of it. Fiscal responsibility, owing to the fact that this was only our second day of vacation, plus general finickiness of one party member (let’s call him “the boy”), dictated lunch at the local McDonald’s. We liked to imagine that someday we would have a week-long vacation featuring 21 meals at 21 different yet affordable restaurants that we can’t find back home. We struggle with the unreality of that ludicrous expectation every time. Maybe someday we would accept McDonald’s as an inevitability on each vacation, but I wasn’t ready to admit defeat yet. Subway still remains on my vacation blacklist after the events of 2003 and 2004, and I would’ve been more than happy to add other franchises to my blacklist as time passes. 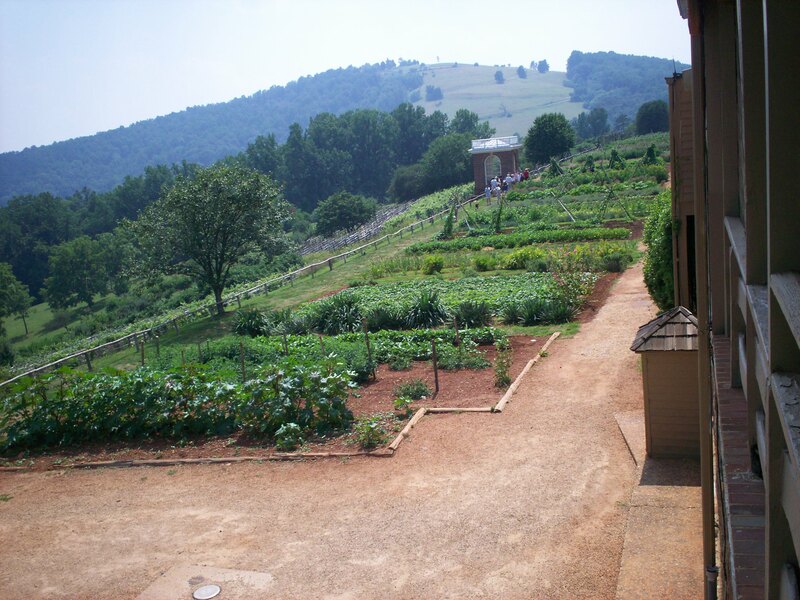 After McDonald’s, we headed up the big, big hill to the attraction of the day — Thomas Jefferson’s own Monticello. $15 per person got you a tour of the grounds and of the house itself. We arrived about 2 p.m. and pulled into a treacherous inclined parking lot with construction signs up announcing the upcoming museum. The tickets for the house were timed and we were chagrined to find out that our tour was not until 3:40. We had over an hour and a half to walk the grounds. We decided to look around a bit at the gift shop first. Much of it was what one would expect — cheesy $3 gifts such as a big plastic nickel, facsimile copies of the Declaration of Independence and pencils with the Presidents on them. There were also the high-end gifts like busts of Jefferson and other Presidents, high-end models of Monticello and chinaware. 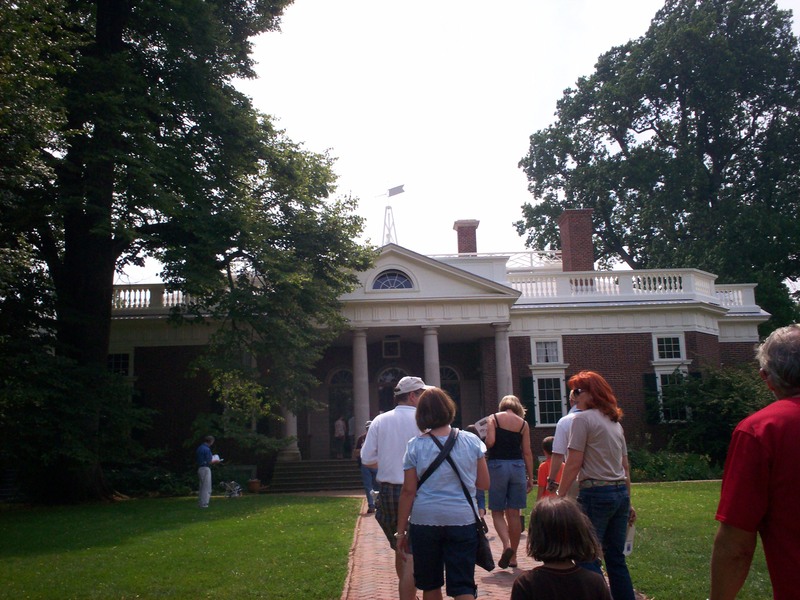 Anne hoped to find a Cat’s Meow Village keepsake of Monticello (if you’ve never noticed these in gift shops, they’re collectible wooden one-dimensional houses with a little cat sitting on or near it), which one of Anne’s sisters collects. Sadly, they had none. We were also told that we had the option to either walk down the hillside and see the sights or take a small shuttle down. As it was an unbearably hot day, we decided to take the shuttle. As it happened, that weekend was dubbed “Plantation Days” at the site, devoted to interpretations of slave life on the farm. We tend to like doing our own thing whenever possible and not be limited to sticking with tour groups. Instead we sallied forth through what was called Mulberry Lane. There were foundations left of buildings where nails were made and food was baked. 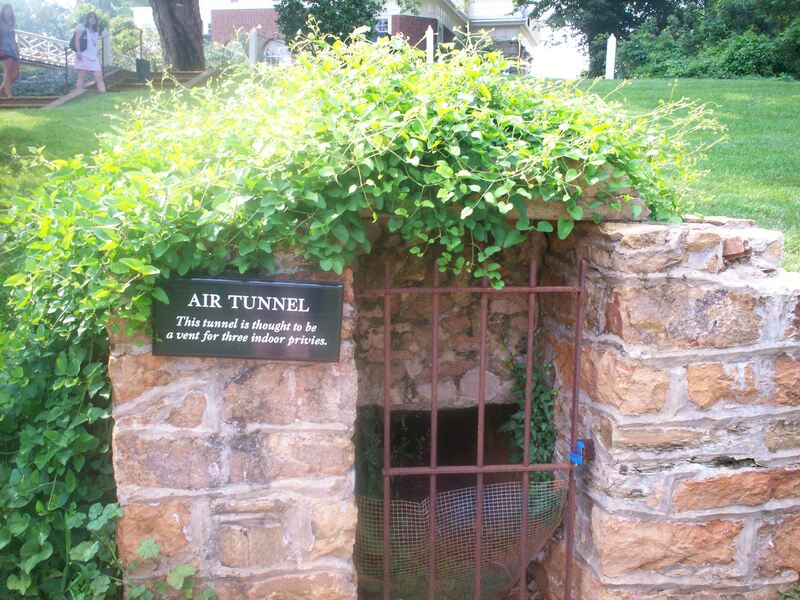 A sample crop and garden were kept alive and growing and fully functional. Interpreters in period costumes played music and worked their crafts. Historical reenactors are considered a mandatory part of such establishments. Sometimes we can take or leave them. I don’t recall if they had an authentic Monticello farmer’s market in place, but it would make sense. Looking above and beyond to the surrounding countryside. 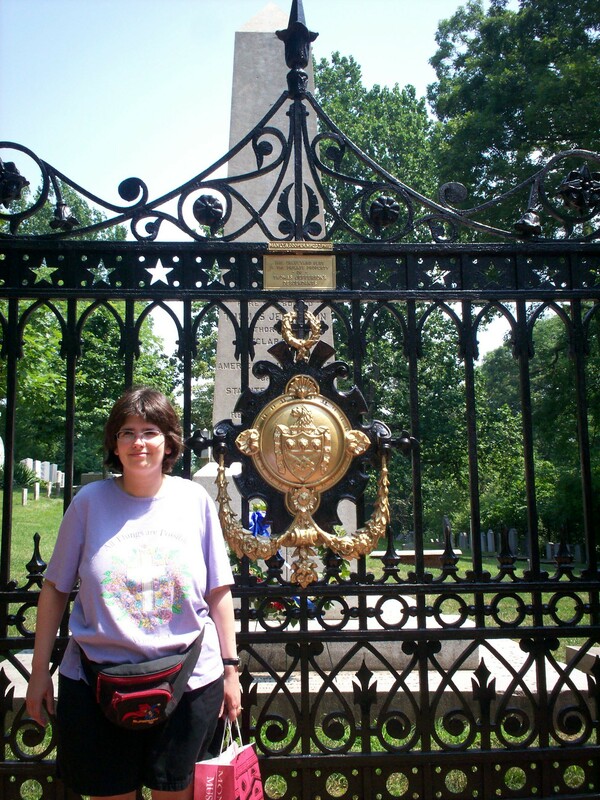 We headed downhill to the family cemetery and saw President Jefferson’s grave. It was really a quite moving experience. You never really get an idea of the realness of these historical figures until you actually see where they’re buried. Anne demonstrates the security fence that prevents visitors from getting too cozy with #3. 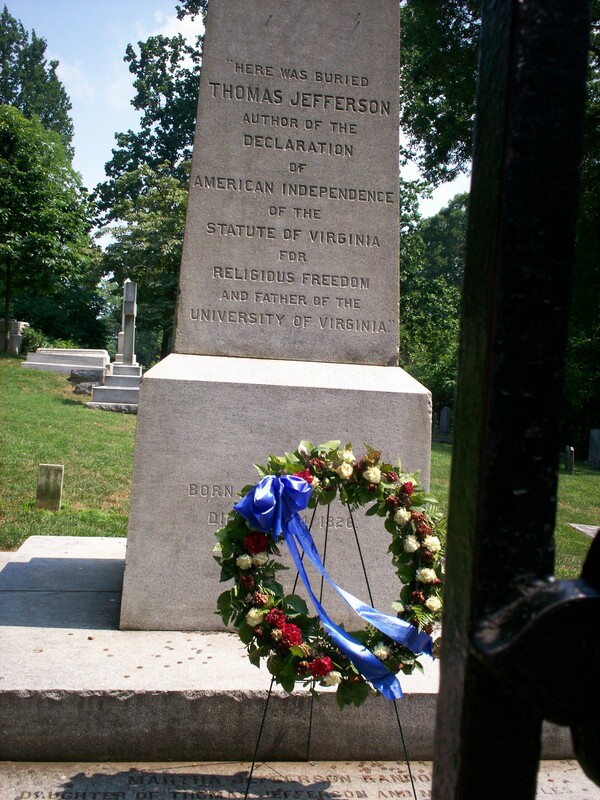 The inscription reads: “Here was buried Thomas Jefferson Author of the Declaration of American Independence of the Statute of Virginia for Religious Freedom and Father of the University of Virginia.” No mention of the Louisiana Purchase, no mention of Minister to France, no mention of governorship of Virginia and no mention of the Presidency at all. The walk back up the hill toward the lines for the timed tours was…difficult. It is much harder to walk uphill on a hot day than down, but we made it and got at the end of the line for our scheduled tour. While we waited, a family speaking a language that sounded like German talked among themselves. Anne and I both took German in high school and college (longtime readers will recall it’s where we met), but we have few occasions to use it and…well…they were speaking conversationally and quickly. We tried to follow, but were lost. Later, another tourist approached them and asked what they were speaking. They confirmed, “Dutch”. So maybe we hadn’t forgotten as much as we’d thought. This way to the home of the Jeffersons. A quick source of amusement occurred when a man tried to walk up a path toward the house and a tour guide stopped him because they try to “keep this path clear for the tourists”. The man responded — missing the point — that he was a tourist. The tour guide answered that tourists are people taking tours. If you weren’t touring, then…you were just a visitor? It was an odd use of semantics as customer control. Finally our turn began and we were brought up the forbidden path to the entrance, where our young perky female guide showed us a unique sundial on the outside of the house, reminded us that there was no photography allowed inside and asked trivia questions. Anne the history buff kept raising her hand to answer like an eager Hermione Granger until people began giving her annoyed looks. After scoring several points she stepped back and let her lagging competition have a try. The inside of the house is surprisingly small. We were told that there is an upstairs, but they do those tours at night and it costs more. The entryway showcases souvenirs of Jefferson’s that were given to him by Heads of States, Native American chieftains, or Lewis and Clark’s expedition. Or rather, replicas of those items, a slightly less awe-inspiring sort of exhibit. From there, we entered an incredibly small parlor. We were told that Jefferson’s daughter schooled her children in here. The parlor led to the small library room where there was a period chair and a cabinet built by one of Jefferson’s slaves (the guide also acknowledged Jefferson’s alleged relationship with Sally Hemings during the tour), but the library contained surprisingly few books, none recognizable to us modern readers. We learned Jefferson donated a large portion of his collection to the Library of Congress after the burning of Washington, D.C. during the War of 1812. The curator of the Library reportedly complained that Jefferson’s donation largely consisted of reference books in foreign languages. A study led off from the library with a number of mechanical contraptions in an open atrium overlooking the Blue Ridge Mountains. 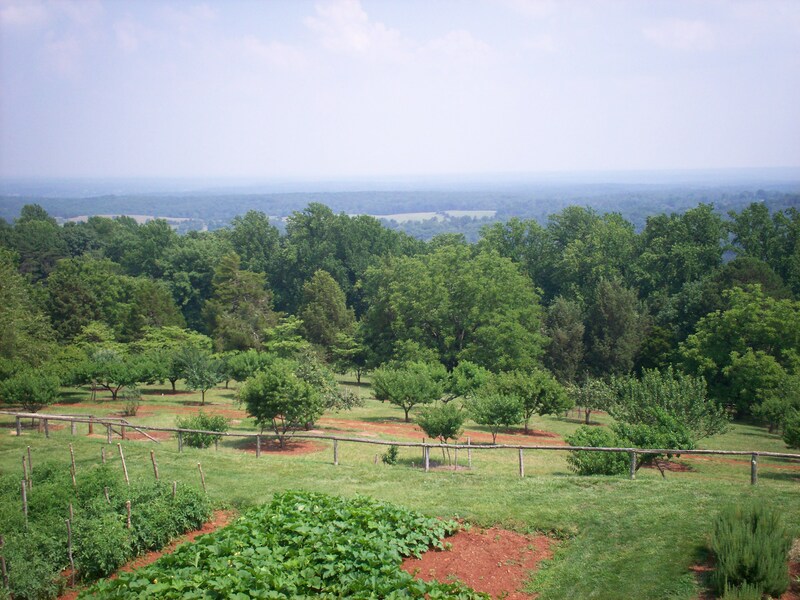 The guide told us that, when we leave the house, we would be able to view the dome of the nearby University of Virginia. The study was particularly impressive to Anne because she had been dying to see some of the objects that Jefferson brought back from Paris after his years as Minister to France. The library contains two tarnished mirrors on either side of the doorway that were part of that shipment. Unfortunately, being unable to take pictures, all we have to rely on are Anne’s visual memories, which I can’t access from here. 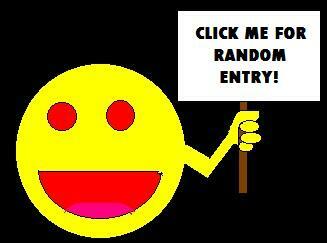 (Should modern science fix that, this entry shall be updated forthwith with bonus pics.) The study was covered on all sides by paintings from Jefferson’s collection, including the Marquis de Lafayette, Sir Isaac Newton and John Locke, as well as a biblical painting of Salome and the head of John the Baptist. The study led into Jefferson’s “bedroom” — in reality, an open alcove where he put his bed between the study and the next room. The whole feel of the home is that Jefferson wanted no wasted space. The bed is exactly six-feet long (Jefferson’s height) because apparently he didn’t need a lot of wiggle room. Next was the dining room, with another large window looking out into the scenery. She showed us the dumbwaiter which brought food and dishes to and from the kitchen down below. We got a view of the corridor which came from underground and a narrow staircase leading to the upstairs before exiting the house. A little boy asked her about the anachronistic air humidifiers/temperature control devices in almost every room. She joked that we would just pretend they weren’t there. Anne offered to the little boy the importance of keeping these old things intact and how heat and moisture are bad for books and papers and paintings and things like that. I don’t know how much that sank in, but she tries to educate when she can. Below, we were able to view the underground area where the kitchen, a refrigeration pit, the “privy” and storage areas were kept. Then we went up again to a walkway behind the house where the dome of the University of Virginia was alleged to be viewable. We looked. We looked again. We strained our necks in an awkward angle. We blinked a few times. The tourists beside us said they spotted it. Then we remeasured our Staff of Ra, took back one kadam to honor Jefferson’s god, and put the headpiece back on. After letting the sun gleam through the headpiece into the dense Blue Ridge forestry, we finally saw the dome waaaaaay off in the distance obscured by trees. Presumably the folks who beat us in this game of “Where’s UVA?” were either locals or big college sports fans. Going back down the hill, we were amused by one sight along the way. To all those romantics out there who want to live in the dashing 18th and 19th centuries: remember the above sight and remind yourself why the 21st century has its benefits. The Jeffersons’ bathroom vent. In the finest going-green style, it uses no electricity. On the way out of Monticello, we drove a bit downhill and found Michie Tavern. More importantly, we found the Michie Tavern Gift Shop. 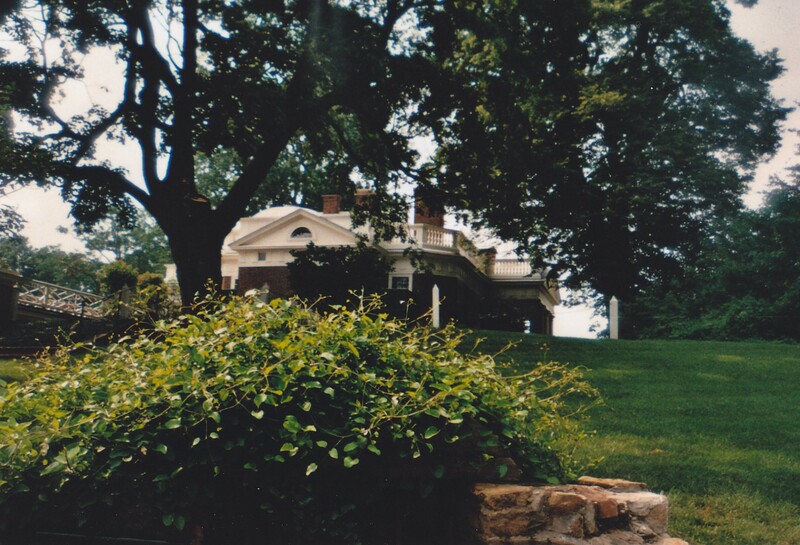 I parked while Anne jumped out of the car, took advantage of their smashed-penny machine to press herself a souvenir, and looked in vain for that elusive Monticello Cat’s Meow. We left the grounds under dark cloud cover and…cue thunderstorm. A thunderstorm on vacation isn’t fun, especially while driving. Especially while driving down a mountain. Long, tense moments ensued before I managed to outrun the storm, to stop scaring Anne with my driving, and to continue our journey east. 1. Cat’s Meow Village has been deemphasized in recent years, but the quest for smashed penny machines continues to this day. 2. McDonald’s is technically part of every road trip, but not in the same way. At some point it became our go-to meal every time we come home to Indianapolis, like a key part of our re-acclimating to ordinary life. Subway, on the other hand, remains blacklisted by me if not by my loved ones.